Two UConn graduates have created a social network that’s based on connecting with the people you actually want to hang out with. Nick Jaensch, 24, and Keith Bessette, 31, have created Shizzlr, with the intention of building a following of college students and 20-somethings. "Facebook is for every person you've met or have come across," Jaensch said. 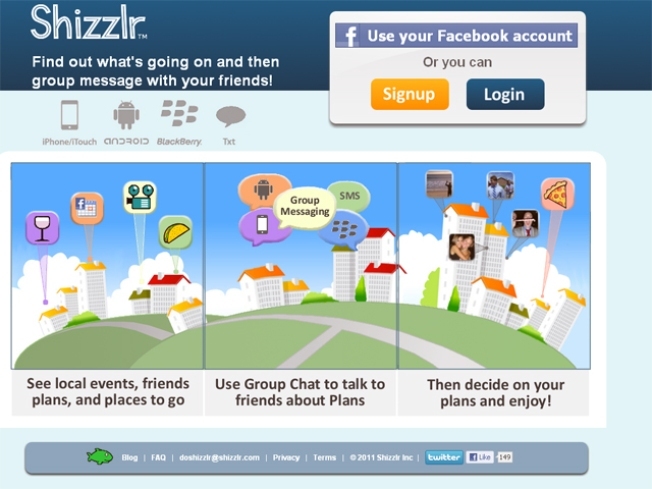 "Shizzlr is for your actual 20 friends and the people you hang out with." "
You opt in only the people you want to include and see what they are doing. It works as a Facebook application, on mobile devices, and from the website, Shizzlr.com. It aggregates and organizes information about your friends' social plans, community events and local establishments for social plan making, according to a news release from the UConn School of Business. Jaensch, of Pawcatuck, and Bessette, of Orange, have raised $200,000 from friends and family and $150,000 from Connecticut Innovations, the state's venture investment agency. They have a few thousand users and hope to reach 50,000 by May. The business model could allow for businesses to pay to highlight their market or shizzlr could sell to merchants user data, such as trends about who is visiting a business and why, he said. Jaensch said he and Bessette will market the website in campus newspapers to student groups, athletic clubs and other organizations. The founders have no idea what the name of their website means. They came up with it after someone wrote a text message, "Do shizzlr," he said. "We kind of took it on as slogan: Good luck, do shizzlr and enjoy," Jaensch said.